Proceq GPR Live is the beginning of a new area in NDT. The outstanding and patented ultra wideband technology combined with a compact wireless scan car delivers unmatched industry performance. Just connect to your iPad and detect objects and backwalls with an unseen clarity. Learn more about how to easily assess concrete with Proceq’s new GPR technology. For availability and regulatory approval of this product in your market, please check with your regional Proceq subsidiary or local dealer. The new Proceq GPR Live comes with the unique Stepped Frequency Continuous Wave technology delivering the widest frequency spectrum in the market. All applications typically addressed with antennas in the range of 0.9 to 3.5 GHz can now be covered with one single device. No need to buy and switch to a different antenna for every testing location. Current GPR solutions, in fact, cover only one frequency which allows to scan for only once specific penetration depth. Additionally, such solutions have large limitations in terms of detectable object size. The Proceq GPR Live iOS app is designed to simplify the entire concrete assessment process. As an example, the integrated wizard assists you with sound feedback during area scans. Another great feature which makes the life of every operator easier is the intuitive object identification marker. The Swiss Made Proceq GPR Live is wirelessly connected with an iOS app to an Apple® iPad. 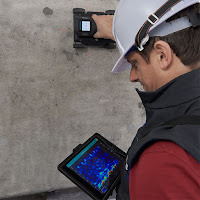 Thus, the Proceq GPR Live allows instant imaging on a high-resolution touchscreen of up to 12.9 inches (iPad Pro) which makes it the largest GPR display in the industry. The compact Proceq GPR Live is built into a lightweight but still robust housing. Ensuring best measurement results even when used in challenging environments. Additionally, the probe operates with standard chargeable AA batteries to guarantee smooth air travels and easy battery replacements worldwide.